Grand Tour riders plan their seasons around whether they’re aiming for the Giro d’Italia or the Tour de France. A little later in the year, a whole bunch of them cross their fingers and hope they just happen to be in decent form for the Vuelta a Espana as well. The third and final Grand Tour of the year is traditionally a race where riders seek to salvage something from their season. Who the hell is racing it this year? Richie Porte hasn’t actually finished a Grand Tour since 2016. Most recently, he fractured his collarbone in suburbia during stage nine of this year’s Tour de France. Of all the riders in this race, he’s the one who could most do with a win, if only to prove to himself that he can actually manage three weeks of racing. Vincenzo Nibali fractured a vertebra when some clown in the crowd brought him down on stage 12 of the Tour. He’s the most successful rider in the race, but broken backs don’t tend to lend themselves to great training you’d imagine, so he might not be in top form. Rigoberto Uran picked up injuries on the cobbled stage of the Tour de France and abandoned a couple of days later. 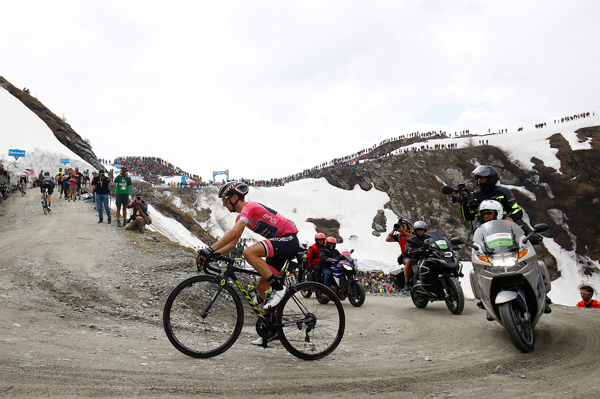 Simon Yates led the Giro d’Italia pretty much the whole way through and looked amazing. However, on stage 18 he showed a hint of weakness and on stage 19 he rode like me and lost 39 minutes. His brother Adam, who was fourth in the Tour in 2016, could only manage 29th this time around, but he too will be riding the Vuelta, supposedly in support of his brother, but you never know how these things are going to pan out. Fabio Aru looked like the saddest man in the world at the Giro. Towards the end, it seemed cruel to let him continue with the camera bikes buzzing around him, documenting his misery. He did eventually abandon, but reckons his health and form have improved and he’s won the Vuelta before. Dan Martin will provide him with support but appears to have no intention of trying to win the race himself. Thibaut Pinot’s Giro was somewhere between Yates’s and Aru’s. He rode well for most of it, then completely folded towards the end. He lost 43 minutes on the penultimate stage and was so sick he couldn’t make the start line the next day to finish the race. Christ this year’s Giro was brutal. Nairo Quintana didn’t get ill or suffer any particularly debilitating crashes at this year’s Tour de France, but he could still only finish 10th. He’s better than that. Alejandro Valverde rode oddly selflessly in the Tour, pointlessly sacrificing his own ambitions for Quintana. Don’t expect him to do the same in his home race. Ilnur Zakarin was ninth in this year’s Tour. He’s better than that. David de la Cruz takes team leadership with Chris Froome and Geraint Thomas both instead riding the Tour of Britain. Team Sky win Grand Tours so reliably that I feel duty-bound to mention this but De la Cruz’s record is actually pretty unremarkable (albeit with the proviso that he’s spent most of the last two years riding in support of others, which can mask a rider’s potential a little). Michal Kwiatkowski is joint team leader. He’s an exceptional rider, but one of his old coaches said his legs were too big to win a Grand Tour. Miguel Angel Lopez is a muscular little climber who came third in this year’s Giro. George Bennett is a Kiwi who finished eighth in the Giro. Steven Kruijswijk was fifth at this year’s Tour and doesn’t seem to deteriorate over the course of a three-week race like most people do. Wilco Kelderman was fourth in the Vuelta last year. Rafal Majka has finished third in the Vuelta before now, but his standard Grand Tour involves having a bad day on an early mountain stage before spending most of the rest of the race in the break. The Vuelta starts on Saturday night with a diddy little 8km prologue. The Vuelta being the Vuelta, stage two is an uphill finish (albeit only short and shallow). Stage four is a summit finish, moderately long but not too steep. Stage nine’s long with a tougher summit finish. My first week recap will either be early and incomplete or late and complete. I can’t say which yet. The ones for the second and third weeks should arrive more conventionally.